SuperCell just announced an upcoming card balance patch for Clash Royale with a lot of changes. The patch will go live March 23. and includes changes to 17 cards! That’s more than 1/3 of all the cards currently in the game, so this is a huge change. I’ll go over the changes and my take on them. 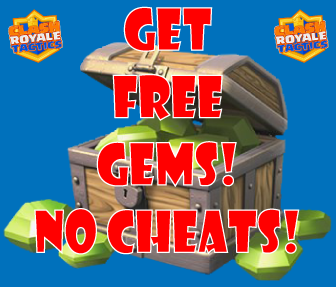 What SuperCell says is that “a core design philosophy of Clash Royale is offense over defense. We’ve always found gameplay based on attacking rather than defending to be much more enjoyable to play and entertaining to watch.” They did some changes based on this philosophy in the February 19. patch, and the upcoming March 23. patch continues along this direction. I am happy they are doing that, and I totally agree with them that attacking is much more enjoyable both to watch and to do yourself. Anyways, lets move on to the card changes. X-Bow: Range decreased to 12 (from 13). This is awesome, the X-Bow is so annoying to play against. Getting your towers killed, or even killing your opponents towers with the X-Bow makes for such a boring gameplay. They say they want to open up the X-Bow to a bit more counterplay which is a very good decision. Tesla: Hit speed decreased to 0.8sec (from 0.7sec), lifetime decreased to 40sec (from 60sec). According to SuperCell Tesla’s use rates and win rates don’t show it as being overpowered. I find that surprising, as I see Tesla in almost every game I’m playing. In either case this is a good change. A lower hit speed will reduce its DPS aginst bigger targets significantly, and also make it more vulnerable to groups of troops. I’ve been starting to use the cannon more and more. It might be a bit overpowered the way it is now, but I think reducing the lifetime with 25% is too much, reducing the damage a little bit would have been better in my opinion. The Princess has a very high use rate and could do with some added vulnerability overall, just look at how often she is used in the TV Royale games. According to top players Arrows won’t be able to take her out at the highest levels, but this change will change that. Another good change, the Ice Wizard doesn’t do enough damage from what I’ve seen. I don’t have the Ice Wizard, but I’ve faced him a lot and found him very easy to deal with. Legendary cards should be awesome, so I totally support buffing him a bit. The Prince is currently the most used card in the game. I guess that’s mainly cause he is one of the first tower killing cards new players get access too. SuperCell says that the Prince is not overpowered when looking at his win rates. but that his ability to take down a towers on his own is too strong. 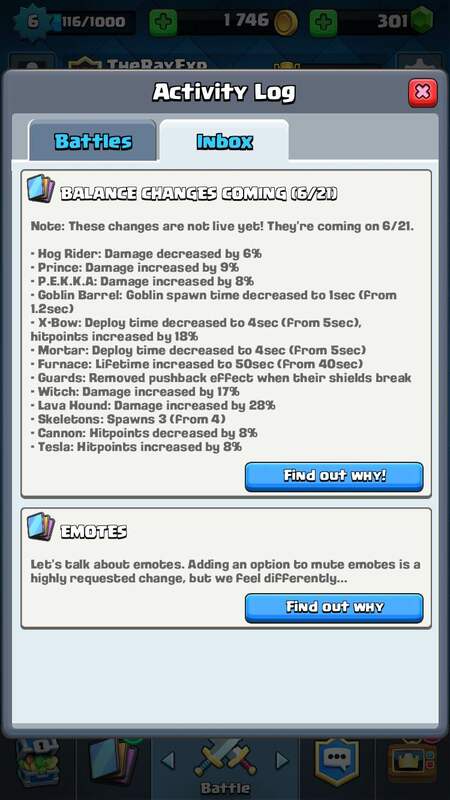 I don’t really like this change, I think it will make the Hog Rider too popular. I don’t like this change either, but I agree that they should change both if they change one of them. It will be interesting to see how this effects the use of the two princes. Awesome, Valkyrie is a cool card but almost noone is using her. Buffing both hit points and damage by 10% is use, so I’m looking forward to putting her in many of my decks. 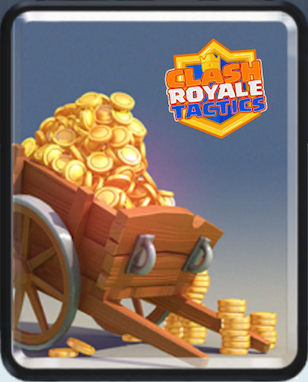 The Royale Giant was one of the first new cards I got access to. I tested him out in like 3 games which I all lost. He just walked slowly across the map and ended up dying without doing anything useful. With 20% more damage this might change though, it will be fun to see. This is a change I’m ok with as well. 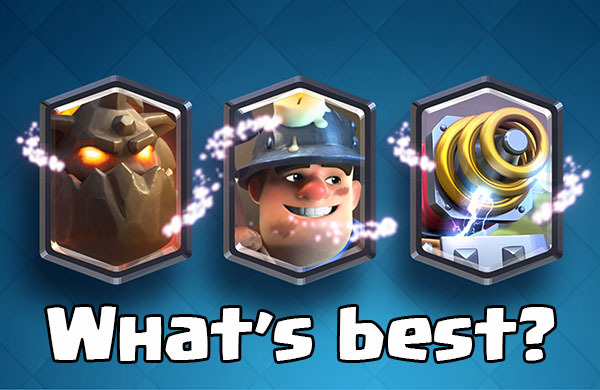 I don’t see the Giant used much to take down towers, and this change should fix that. Maybe I’ll even start using him again. I face players who use Rage quite often, and if they have a lot of troops inside the spell area it is very powerful. Increasing the movement and attack speed is clearly a buff to the card, which I don’t think it needs. The duration is of much less importance due to most troops being dead before the spell runs out. Poison has fairly low use rates and more damage should be good for it. I think Poison is a really cool spell, and now it should fit in more decks and replace Fireball or Arrows. I don’t have any of the two Legendary Cards so I can’t say much about this change. I guess this is an issue among top players. I would like to see 8 elixir, I still think 9 is too much for a card that can be killed by one Fireball. During overtime with Elixir Pumps in play there might a role for the Three Musketeers now however. Archers are great and this will make them even better. I use Archers in most of my decks already and I’m wondering if this change will make them too strong. Quick initial attack basically means that they will attack just as quickly as Spear Goblins. I don’t like this change. The Balloon is a very challenging card to face for newer players. I remember they first time I got beaten by this card, it was so frustrating. Increasing the hit points would make this even harder to face for newer players. I understand if the card is not strong enough at higher levels, but how about just increasing the hp more at the higher levels of the card while leaving the level 1 version the same? I never use the Witch so I agree that she needs a buff. I’m not sure if the 5% increased damage will make me put her in my decks though, but at least it’s worth testing her out again. This is a video of GamingWithMOLT discussing the upcoming patch, he is quite happy about it as well. I am very happy with these balance changes overall. I like that they again say that they will focus on making this an action packed game where the attacker is the winner, not the Sim City player who builds a lot of buildings. What do you guys think? i love this cards . the three musketeers are the best for me i adore them ahahha they do a great job.